Preserving the History and Traditions of the Republic of the Marshall Islands. Micronesia has had extensive contact with four different countries and their governments since the 1800s — Spain, Germany, Japan, and the United States. 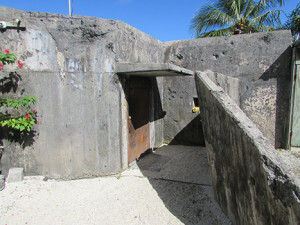 Although Spanish influence was very strong in the eastern part of Micronesia, especially in the Marianas, there was little contact in the Marshall Islands. Germany was the first country to establish extensive contact with the Marshallese, when copra (dried coconut) trade was developed by the Godeffroy Company of Hamburg. Some atolls and islands such as Likiep, and parts of Jaluit and Maloelap, were bought by individuals and companies to establish copra plantations. These purchases were arranged by the iroojs and company heads and often the resulting situations were a serf-like system of servitude and work. Because of disputes with Britain and Spain, the German government on October 15, 1885, held a formal ceremony and a Declaration of Protection was signed by German officials and Marshallese iroojs, to emphasize that the Marshall Islands were under the protection of the German Empire. The major commercial and government center was Jabor, Jaluit, where regular shipping services carried the copra to Asian ports. Considerable scientific research was carried on in the Marshalls and the rest of Micronesia by German scientists and anthropologists during this time, and these reports were later printed in German as the Hamburg-South Sea Expedition. One of the obvious influences from German contact is the Marshallese word for money which is “mark” although today with English language influence this older term is being superseded by the word “money” into the Marshallese language. In October 1914 Japanese naval squadrons took military possession of the Caroline and Marshall Islands and the German administration abruptly ended. For many years Japan had been interested in the islands of Micronesia, especially the large, high ones such as Saipan, Yap, Chuuk, and others, for colonizing and obtaining raw materials. Thus the number of Japanese in Micronesia increased rapidly and resulted in a strong and lasting influence. Cities were built and sugar cane plantations were established. 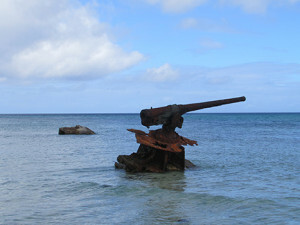 As many as 45,000 Japanese were living on Saipan by 1940. As for the Marshalls only 680 Japanese were in Jaluit by 1940, but still they made a tremendous impact on the culture and people. Schools were established and people learned Japanese. Today only a few of the oldest people still speak Japanese fluently. Although Japanese control began with the military, in 1922 it was mandated and civilian control established under the League of Nations. Until 1935, when they withdrew from the League of Nations, Japan governed Micronesia under the mandated agreement. During this time, in the Marshalls, copra production greatly increased through intensive programs and subsidies given to the people to plant more coconut trees. The Japanese organized the transportation of copra, and the supply of goods was fairly regular and profitable for all. Also the production of hand-crafts was greatly encouraged and made profitable. Often the older Marshallese will say this was the good time for all, because there were regular field trip ships, a fair amount of money, and supplies to buy. One of the biggest influences made by the Japanese was the introduction of rice to the diet, to the point where it is the preferred food by most Marshallese today! After 1935, the Japanese began to fortify the islands of Micronesia and this eventually lead to the U.S. invasion of the Marshall Islands on Kwajalein Atoll on the last few days of January 1944. From Kwajalein the U.S. forces moved to Enewetak which was captured February 17-19, 1944. From there the U.S. forces moved throughout the Marshalls and Micronesia capturing the islands from the Japanese. Since this time, the U.S. government has been the dominant foreign power in Micronesia which includes the Mariana Islands, Caroline Islands (Palau, Chuuk, Pohnpei, Kosrae) and the Marshall Islands. Military government was established on January 31, 1944 with the responsibility placed in the hands of the Commander in Chief of the U.S. Pacific Fleet and Pacific Ocean Areas and Admiral Chester Nimitz was designated as Military Governor of the Marshalls. From this point on numerous organizations and agencies were called on to assist with reconstruction in the islands. Environmental, economic, and anthropological surveys and studies were made to determine the situation on particular islands and Micronesia in general. In 1947 Micronesia was established as a strategic Trust under the U.N. Security Council, the only Trusteeship set up in this manner after WWII. It became known as the Trust of the Pacific Islands and was administered by the U.S. under the auspices of the United Nations.